As the sun rose over the foothills of the Hindu Kush, sounds of laughter echoed in the valley. Most of the town was still sleeping or lingering next to their stoves for warmth while eating breakfast, but 12 young women were outside, lacing up their skates to step onto Afghanistan’s only ice rink. Last year, Free to Run started the very first ice skating program in the country with the aid of the Canadian Embassy in Afghanistan. This year, the ice skating program was supported by fundraising efforts from Canadian Martin Parnell, a well-known speaker, author and the holder of multiple Guinness World Records for running. After learning the basics in 2017 of how to stand on skates, fall, and get back up... the aim this year was to develop the skills of a core group of determined young women and girls. An International coach generously volunteered to travel and spend time with our team. After just a few lessons, they quickly moved on to hockey training. 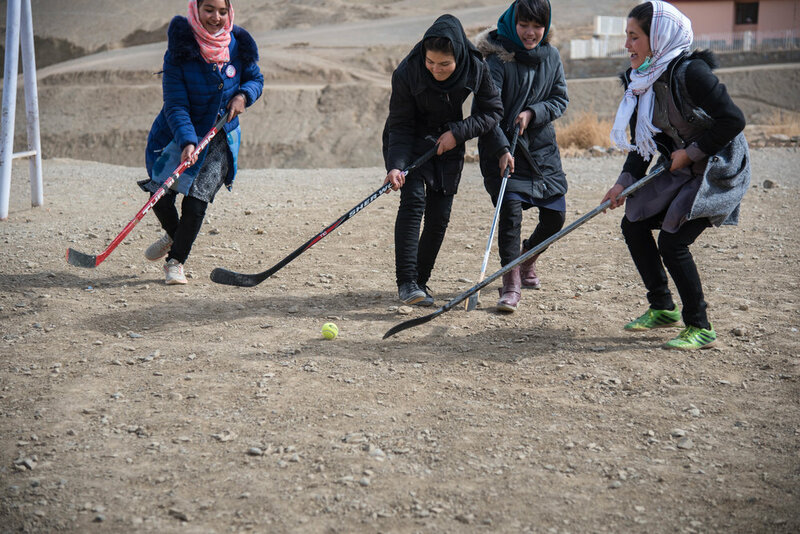 It turns out that Afghan women and girls really enjoy hockey as well! Team practice with an international skating coach. Building confidence on the ice. Learning the basics of hockey. Our participants would skate from the early morning until around midday when the sun hit the ice making it too soft to skate on. They would then return in the late afternoon to help us clean and maintain the ice. Everyone wanted to learn how to maintain the equipment and rink so they could continue to practice after the international team departed. A male and female instructor were selected and trained to lead future practice sessions. The cold weather and strong interest in winter sports gave us the perfect opportunity to host the second annual, Winter Sports Week. Seven members from our Central Program and four from the Northern program joined the Central Highlands team for a special week of winter sports. The first meal with the entire group was quiet, each group eyeing participants from the other regions shyly. After lunch, we packed everyone up into a bus and took them out into the mountains to go skiing. The Central Highlands group skis regularly, and soon became the teachers for our participants from the other provinces. After the first girl fell, the silence was broken by laughter and never returned. street hockey basics, cycling, and team runs. Several participants attended the 8th Annual Afghan Ski Challenge, where they competed in the women’s challenge. The 8th annual Afghan Ski Challenge. At the end of the week, our entire team participated in the first Ice Skating Challenge sponsored by Etisalat, which took place on a UNESCO designated lake. It was the very first time any Afghan had ice skated on this lake so a number of locals came out to watch the event. Our thanks to everyone who made this very special week possible including our participants, skating coach, Etisalat and Martin Parnell!